Brisbane Australia’s Psych/Garage cult Sacred Shrines played their first show in March 2014, launching their debut 7 inch at the same time. During their brief tenure, they have shared stages with The Dandy Warhols, Flyying Colours, Tumbleweed, The Murlocs, ORB, Stonefield and many more. The band released their debut album in July 2016, with tracks mixed by Brett Orrison (The Black Angels), Michael Badger (King Gizzard & The Lizzard Wizzard) and Liam Judson (Cloud Control) and followed that up with a 6 track EP entitled TRAIL TO FIND in 2017. Sacred Shrines return to the live stage with new single Front Row Future, lifted from their second album due in 2019. The song was recorded and mixed by Donovan Miller and is somewhat of a departure from their earlier work. It’s an atonal, swamp-rock boogie that sounds like it would be at home in some dive bar at the end of the world. Sacred Shrines will be on tour throughout the rest of 2018 around Australia. 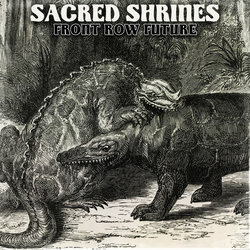 Front Row Future is the first single taken from Sacred Shrines' second album due in 2019. The song was recorded and mixed by Donovan Miller (FOREVR) and mastered in Nashville by Jim DeMain. It’s an atonal, swamp-rock boogie that sounds like it would be at home in some dive bar at the end of the world.